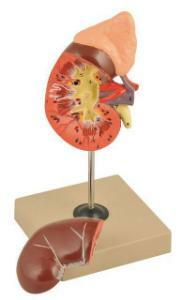 This life size replica of a human kidney highlights kidney functions. The adrenal glands, the renal and adrenal vessels are emphasized to show how blood is filtered. The removable front half of the model allows students to study the renal cortex, medulla, and the division of the renal artery down to the capillary level.